Here you will find information and resources for local authority co-ordinators. 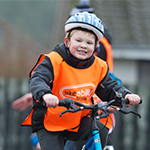 Most Bikeability Scotland training is delivered to pupils in schools, organised through their local authorities. The training is often co-ordinated by Active Schools or Road Safety Teams, and sometimes by other teams including Education and Travel Planning.